This article is about the American science educator. For other uses, see Bill Nye (disambiguation). William Sanford "Bill" Nye (born November 27, 1955), popularly known as Bill Nye the Science Guy, is an American science educator, comedian, television host, actor, writer, scientist and former mechanical engineer, best known as the host of the Disney/PBS children's science show Bill Nye the Science Guy (1993–98) and for his many subsequent appearances in popular media as a science educator. Good science makes a clean environment. Karen Gaudette (February 3, 2000). "Legislature: Science guy tells rally: Vote". The Columbian. Associated Press (Vancouver, Washington): p. B2. Everything you can touch and depend on in our society goes back to science. Amy Raisin (February 20, 2000). "Champs Science Bowl goes to NOHO". Daily News of Los Angeles: p. N1. We want to get young people excited about inventing so they'll be future inventors, and change the world. Alissa MacMillan (July 2, 2000). "Click Life - Where kids get plugged in". New York Daily News: p. 9. The invention process is a great exercise for kids. It compels them to define an actual problem, formulate an original solution, develop a product, and share the results or products with their friends and peers. Pam Cloud Smith (August 25, 2000). "Nurturing the inventor in your child". Southwest Times Record (Fort Smith, Arkansas). Science is the most important thing you can study in school. Associated Press (December 10, 2000). "TV host decries U.S. failure to value science, math education". The Star-Ledger (Newark, New Jersey): p. 35. The passion and beauty and joy of science is that we humans have invented a process to understand the universe in a way that is true for everyone. We are finding universal truths. I encourage you to look at the world around you and think about how it works. My friends, you can go forth and make this world a better place. Connie A. Higgins (October 24, 2001). "Science Guy Wants You to Ask, 'Why?'". The Columbus Dispatch (Ohio): p. 03I. Without clouds we wouldn't have rain. Without rain there is no water, no crops and no food for you and me. Humans would not exist without the sun, heat, water and oxygen from plants. When people start rejecting the fundamental understanding of the world that scientific process brings you, well, that's bad in my opinion. Bill Buell (March 9, 2005). "Bill Nye, the Science Guy, brings humor to normally serious field". The Daily Gazette (Schenectady, New York): p. D-01. When people, some of them very intellectual, claim that evolution is not true, I get a little nervous. I might be trying to change the world, but I also better be funny while I'm doing it. I've never lost sight of that. I don't want people memorizing the planets or counting how many plants there are in the world. But I want them to know that the world is 4.56 billion years old, and I want them to know how we know it is 4.56 billion years old. It's wonderful and exciting, and it creates a reverence for nature. When I see people reject all that, it's kind of creepy. I find both humor and grimness in most issues. Tom Paulson (April 5, 2005). "That science guy is back, in 'Eyes of Nye'". Seattle Post-Intelligencer (Seattle, Washington): p. E1. I'm an educator. You do what you have to do to get what you are saying across, and if that means being funny, that's what I do. Associated Press (June 8, 2005). "'The Science Guy' returns to tackle issues for older audience". Journal Gazette (Mattoon, Illinois). There are major issues that people - as taxpayers and voters - will have to make informed decisions on in the near future. They will need to understand the science and the ethical considerations to form their opinions. Some of these are issues that will affect humanity for decades to come. Global climate change is a big deal to me. We need to change our ways. Jeff Ertz (April 1, 2006). "Bill Nye ‚ Foundation fundraiser guy". The Reporter (Lansdale, Pennsylvania). Change the world - even if ever so slightly - is my goal. Pat Whitney (February 21, 2009). "Nye: We must all save the Earth". The Madison Courier (Madison, Indiana). The single biggest impact a person can have on the Earth is driving a car, either driving a fuel-efficient car or just driving it less. It will take more time for the change we have to effect, but we don't have more time. The carbon dioxide on Earth, just in the last four years, has increased from .03 percent to .04 percent. And the change will have a significant impact on everyone. Half the humans are women, so I think half the scientists should be women - a legacy of my parents. The Earth has never warmed this fast. We need to see how much we can change the world in the next 20 years. The Earth is just a speck of sand in the universe. And there's no cavalry coming over the hill to rescue it. The more we learn about volcanoes, the more we learn about the earth. Learning about the earth is more important than it has ever been. Paula Collucci (May 18, 2009). "'Science Guy' Visits Volcano". The Chronicle (Centralia, Washington). Carbon dioxide has never entered the atmosphere so fast. In 1976 the carbon dioxide level was at 0.03 percent. We've lived through a change to 0.04 percent. People like to grab stuff, hold things in their hands and make things happen. Children’s museums are ideal for these kinds of things. There’s nothing more fun, to me. Mark Bennett (September 24, 2010). "Bill Nye still rocking science - TV personality making weekend appearance in town to help open Children's Museum". The Tribune-Star (Terre Haute, Indiana). If I were the king of the forest, and I’m not, we would have more astronomy. When you compare Mars to Earth, and Venus to Earth, you can see the problem [earthlings face]. We do not want to become Venus. It's not cool ... or it's not cool enough. The world is getting warmer, that's all there is to it. I want you guys to stop this. I want you to change the world. Meagan Engle (January 31, 2011). "‘Science Guy' Nye tells Miami students to ‘change the world'". Oxford Press (Ohio). It is this fragile nature of the earth's atmosphere that I want everybody to appreciate. It's what I call your place in space. To exclude kids in formal education from science is bad for everybody. J.D. Velasco (October 25, 2011). "Study: California's elementary schools barely teach science". The Whittier Daily News (California). I will assert that U.S. economic growth is in lockstep with science and technology and, by extension, science education. If we found life on Mars, it would change everybody's view of our place in space. Mike Anton (November 20, 2011). "Fully loaded robot heading off to Mars". The Seattle Times. Los Angeles Times (Seattle, Washington). Spacecraft sent to Mars, Saturn, Mercury, the moon, comets, and asteroids have been making incredible discoveries, with more to come from recent launches to Jupiter, the moon, and Mars. The country needs more of these robotic space exploration missions, not less. Tom Beal. "Space research here faces a horizon of closures, cuts". The Arizona Daily Star (Tucson, Arizona). Evolution is the fundamental idea in all of life science, in all of biology. It's like, it's very much analogous to trying to do geology without believing in tectonic plates. You're just not gonna get the right answer. Your whole world is just gonna be — a mystery. Instead of an exciting place. Lily Kuo (August 28, 2012). "Bill Nye the Science Guy: - Creationism not good for kids". The Chronicle. Reuters (Willimantic, Connecticut). When you have a portion of the population that doesn't believe in (evolution) it holds everybody back, really. We need scientifically literate voters and taxpayers for the future. How could there be billions of stars more distant than 6,000 years, if the world is only 6,000 years old? "Bill Nye defends evolution in Kentucky debate". The Times and Democrat (Orangeburg, South Carolina). February 4, 2014. I just want to remind us all there are billions of people in the world who are deeply religious, who get enriched by the wonderful sense of community by their religion. But these same people do not embrace the extraordinary view that the Earth is somehow only 6,000 years old. If we continue to eschew science ... we are not going to move forward. We will not embrace natural laws. We will not make discoveries. We will not invent and innovate and stay ahead. Dylan Lovan (February 5, 2014). "'Science Guy' Bill Nye defends evolution in debate". St. Paul Pioneer Press. Associated Press (Minnesota): p. A12. Please, you don't want to raise a generation of science students who don't understand how we know our place in the cosmos, who don't understand natural law. Sarah Whitman (February 7, 2014). "Age-old feud: In the beginning". Tampa Bay Times (Florida): p. 3. Nature is bottom up. It's compelling and complex, and it fills me with joy and it's inconsistent with the top down view. You don’t need a PhD in climate science to understand what’s going on, that we have overwhelming evidence that the climate is changing. That you cannot tie any one event to that is not the same as doubt about the whole thing. Sandy Fitzgerald (February 16, 2014). "Marsha Blackburn Takes on 'Science Guy' on Climate Change". Newsmax.com. Look at the facts. We need you to change things, not deny what's happening. What we want to do is not just less, but do more for less. I want the United States to lead the world in this. The more we mess around with this denial, the more we lose." We have overwhelming evidence that the climate is changing. That you cannot tie any one event to that is not the same as doubt about the whole thing. There is no debate in the scientific community. "Bill Nye , ‘the science guy,’ vs. Marsh Blackburn, the climate change skeptic congresswoman". Knoxville News Sentinel: Blogs (Knoxville, Tennessee). February 17, 2014. "The problem is we have this thin atmosphere and a lot of people trying to breathe it. It's this thinness of the atmosphere that has allowed humankind to accidentally change the climate of the planet. Sherri Cruz (March 21, 2014). "Popular science guy". The Orange County Register (Santa Ana, California). Kloor, Keith (November 6, 2014). "Bill Nye Explains Why he is a GMO Skeptic". Discover Magazine. Retrieved on October 15, 2015. I went to Monsanto, and I spent a lot of time with the scientists there, and I have revised my outlook, and I'm very excited about telling the world. When you’re in love, you want to tell the world. Kollipara, Puneet (March 3, 2015). "Proof he’s the Science Guy: Bill Nye is changing his mind about GMOs". The Washington Post. Retrieved on October 15, 2015. Was it appropriate to jail the guys from Enron? ... Was it appropriate to jail people from the cigarette industry who insisted that this addictive product was not addictive, and so on? ... In these cases, for me, as a taxpayer and voter, the introduction of this extreme doubt about climate change is affecting my quality of life as a public citizen. ... That there is a chilling effect on scientists who are in extreme doubt about climate change, I think that is good. Nye, a Cornell University graduate with a degree in mechanical engineering, studied under the late astronomer Carl Sagan. Nye has won numerous daytime Emmy Awards and has been named outstanding performer in a children's series. Nye, who grew up in Washington, D.C., graduated from Cornell University in 1977 with a degree in mechanical engineering. He was lured to the West Coast by Boeing and made an immediate and significant contribution, designing a hydraulic pressure resonance suppressor for their 747s. Nye worked for Boeing from 1977 through most of 1980, but left to take a position as a licensed mechanical engineer for the state of Washington. In 1992, Nye began doing his own show, 'Bill Nye , the Science Guy,' on PBS. The series' 100 shows produced four Emmys for Nye in eight seasons before he began developing other interests, such as doing short documentaries for the Discovery Channel. His latest production, 'The 100 Greatest Discoveries,' is currently airing on the Science Channel. 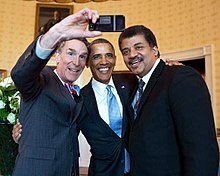 Bill Nye is many things: comedian, scientist, author, inventor, TV personality. He has a cult following among science teachers. Cindy Workowsky, spokeswoman for National Science Teachers Association — cited in: Associated Press (June 8, 2005). "'The Science Guy' returns to tackle issues for older audience". Journal Gazette (Mattoon, Illinois). It's his gift. He makes science understandable and fun, and he knows how to connect with people. Bruce Lewenstein, Cornell communications professor — cited in: Associated Press (June 8, 2005). "'The Science Guy' returns to tackle issues for older audience". Journal Gazette (Mattoon, Illinois). Nye has been instrumental in making science fun for preteen audiences‚ but when he is speaking at a collegiate venue he focuses more on topics he’s serious about. Nye, who earned a mechanical engineering degree from Cornell University, combined his love of science with his flair for comedy when he won a Steve Martin look-alike contest in Seattle. He eventually quit his day job as an engineer to focus on comedy writing and performing. The decision led to the creation of 'Bill Nye the Science Guy,' which won 28 Emmys in five years. He also won seven national Emmy Awards for writing, performing and producing. A graduate of Cornell University, Nye began his career as an engineer. In fact, Boeing still uses his hydraulic pressure resonance suppressor today. By the mid-1990s he had his own television show, 'Bill Nye the Science Guy,' which was shot entirely in Seattle. Nye and his show won several Emmys. His latest television series is called 'Eyes of Nye'" Lately, Nye has focused considerable attention on environmental science. Bill Nye left a lasting impression on youngsters (and their parents) who watched his Emmy Award-winning television show “ Bill Nye the Science Guy” from 1993 to ’97. They saw him explain chemical reactions using steel wool, electricity, oxygen and a balloon, and saw him demonstrate gravity by throwing a watermelon, milk carton, tofu, a lamp, a computer and a TV off a building top. His show made science fun, and kids loved it. Nye grew up in a science-minded family in Washington, D.C. His mom was a math and science whiz. His dad manufactured sundials. His grandfather was an organic scientist. Fittingly, one of young Bill’s favorite hangouts was the original Smithsonian National Air and Space Museum, which looked like a small Quonset hut. Bill Nye [is] executive director of the Planetary Society, the Pasadena, Calif.-based nonprofit that advocates for space exploration. If you could invent a better battery, one that can store more energy using less exotic metal, one that could handle the heat without loss of performance or just plain catching on fire, we could store energy from the wind and the Sun and have it available whenever we need it. You would change the world all right. You might also get rich – crazy rich! "Bill Nye challenges grads to 'change the world'". The Eagle Tribune (Lawrence, Massachusetts). May 18, 2014. This page was last edited on 1 April 2019, at 23:26.